To me, the words “Right to Work” suggest that if I am willing and able to work, I can reasonably expect to receive employment. In the real world, of course, the Employer has a “Right to Hire” which trumps any rights in that respect I might have. An employer doesn’t have to hire anybody if he finds someone else he thinks can do the job better, or if he doesn’t have enough work available to keep a hire occupied. That’s the way things are. But laws designated as “Right to Work” laws have nothing to do with that. They have little to do with the worker at all. They’re all about what accomodations employers have to make for Unions and about putting limitations on those Unions. 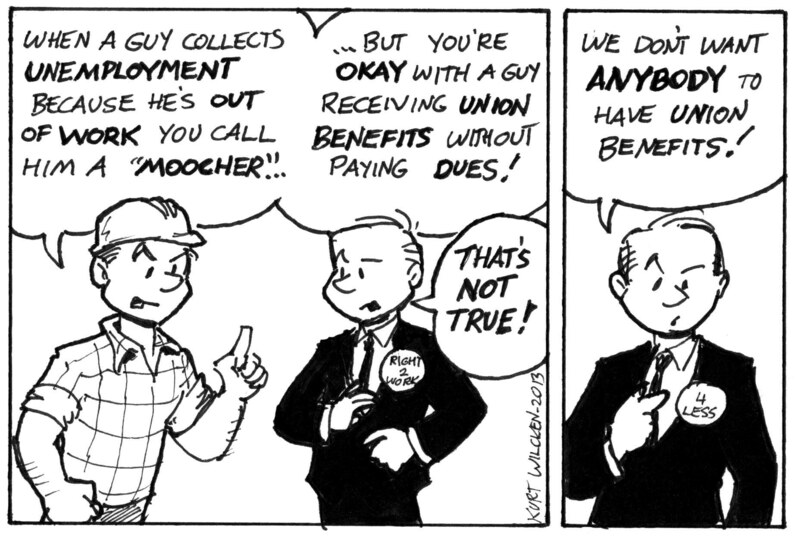 Oh, “RTW” does protect a worker’s right not to have to pay union dues. I knew a guy at a union shop I used to work at who didn’t like his dues going political candidates he he opposed. The Union let him opt out; they had to, it was in the contratct. The Union was still legally required to represent him, and he still gained the wages and benefits of the contract the Union negotiated with Management. He just didn’t have to pay two hours of wages a month to get them.